We are not starting from scratch. Our institutions have been substantially weakened. But they still exist," says Hedayat Amin-Arsala, minister of finance of Afghanistan Interim Authority. Hidayat's statement has more meaning now when the interim government is struggling hard to convene the Loya Jirga and to chart out his country's reconstruction through a new constitution. And as of now, the process is dictated by the us consortium dangling the carrot worth us $4.5 billion. Afghanistan now faces the proverbial million-dollar question: which way to go from here. As the past suggests any move to impose a us-backed central government may backfire, while on the other hand, the enormous money pledged will not come as it is conditioned to this. The Loya Jirga is going to decide this, and the future. Hedayat's statement is a reminder to what the future is in store. For the desperate people of Afghanistan, it is another round of 'great game' played by usa. usa is just repeating what it has done elsewhere like in Kosovo or in Somalia and in Afghanistan in the 1980s, when it was fighting a proxy battle with the ussr. After bombing the country, it is getting the un to arrange the 'reconstruction' of the failed state. As elsewhere, it also installed a provisional government of its supporters, like the Karzai government in Afghanistan, and mobilised the un through allies to enforce its own interest. Two crucial issues now haunt the interim government and for that matter the people of Afghanistan: the form of governance and the nature of development. As far as the form of governance is concerned, it has polarised the country over the traditional and the modern form of government as pushed by usa. There is a growing protest now on the imposition of the new government and new constitution. Syed Ishaq Gailani and Pir Gailani, two prominent Afghan leaders in exile and supporters of the Bonn agreement, feel that Afghanistan should be left to decide on its own form of government, independent of the us and other countries. Will the us allow that to happen? Or will it become another ordinary under-developed American-prone country? "No," says the 65-year-old Mohammed Noor, a tribal elder of Jalalabad, "Remember from Alexander the Great to the British to the Russians...the invaders are enemies. We will do it with the Westerners, if we understand they want to impose us their will." That is the dilemma that the interim government has to sort out before convening the Loya Jirga and finalising the new constitution. But the much publicised pledge of us $4.5 billion is nowhere in sight. Even the interim prime minister has appealed twice to the world community to give the pledged money within one month. At a meeting held in Tokyo on January 21-22, 2002, the International Conference on Reconstruction pledged us $1.8 billion for the first year and us $4.5 billion for the first 30 months. Development experts who met in Paris on May 4 called for the speedy release of funds. "The budget is not completely financed and it is essential that the funds be made available more quickly," said Jean-Claude Faure, head of the Development Assistance Committee for Afghanistan at the Paris-based Organisation for Economic Cooperation and Development (oecd). "The (Afghan) budget is short of us $ 100 million," said oecd development specialist Michael Roeskau. But problems abound. There are already talks of usa not channeling its aid through the proposed Central Trust Fund by the World Bank and many other countries have also hinted about it. And the fear of usa washing its hands from the ruins of Afghanistan is gradually gaining ground. On the other hand, experts feel that the huge money pledged will be spent on building an army and a centralised government structure, leaving very less for the crucial sector like agriculture and water. In 2000, before the us-British bombing, all appeals for help to Afghanistan fell on deaf ears; only 12 per cent of all appeals were pledged. And this is considered as one of the reasons for not controlling the spread of opium cultivation as no alternative could be offered. Funding for agriculture and forestry amounted to 10 per cent of the requested funds. "If imf and World Bank enter, we can expect only massive building activities pushing the real issue of people's livelihood into oblivion," says Farouq Ahmed. One question often asked is whether Afghanistan has the capacity to absorb this huge amount of money? It still doesn't have a banking system and printing of currency is still controlled by a warlord. The situation is so acute that the interim prime minister is receiving cash money in suitcases from countries like India during his recent tours. In fact, the World Bank and the imf, and undp are emerging as the key players in Afghanistan's reconstruction. World Bank and the undp have already come out with strategic papers for reconstruction of the country. They have asked for the us $4.5 billion to be channelised through them. The Transitional Support Strategy for Afghanistan of the World Bank hawks for its prominence: "The Bank will use its comparative advantage to support the Afghan authorities in building essential institutions and capacity to manage the large inflow of aid resources. The Bank has worked closely with un agencies, ngos and bilateral donors on assistance to Afghanistan in the past." The bank has even activated its Watching Brief policy under which it monitors countries in conflict for reconstruction activities. Similarly, the undp strategy revolving around establishment of governance has set in place a formula to rebuild the country. David Lockwood, deputy regional director for Asia pacific, undp, says, "We need to reactivate the 2,000 local committees which will facilitate the local rehabilitation and governance." The Bank even warns in its transitional support strategy for Afghanistan: "If assistance is not provided quickly to help the government respond to the needs of the population and manage the inflow of aid resources, there is a risk that the fragile political and security environment will unravel and that donor resources will be wasted and international support lost." In all the meetings of the potential donors, this aspect has been discussed as a political strategy as usa since the beginning of the military operation has been using money as a major tool for bringing together the fighting factions. "To begin with a grossly over-ambitious programme of reconstruction risks acute disillusionment, international withdrawal and a plunge into a new cycle of civil war and religious fanaticism," says a policy brief of Carnegie Endowment for International Peace released in January. "The situation in Afghanistan is still confused and complex. Under the present circumstances, it is rather premature to talk of development and reconstruction. Unless tribal factions come to consensus the chances of development are bleak. It is the economic activity, which could facilitate future administration and simultaneous development," says Kalim Bahadur, a Delhi-based political analyst. Till now the talk of reconstruction has ignored the restoration of the natural resource systems, so crucial to Afghanistan's economy. Rural recovery cannot be discussed without parallel discussion of critical natural resource issues. "Environmental issues should form a part of the package being considered by governments for the rehabilitation of Afghanistan," says Klaus Toepfer, executive director of the United Nations Environment Programme (unep). The major environmental challenge facing Afghanistan is the impact of the return of refugees on already stressed water and forest resources. When the refugees returning to rural areas, the carrying capacity of the land will depend not only on food and fuel supplies, but more broadly on success in rehabilitating agricultural systems -- particularly irrigation systems -- seeds and fertilisers. Afghanistan is at crossroads. 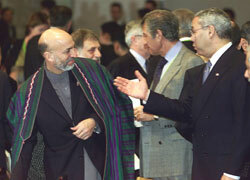 The king, Zahir Shah, has returned to open the Loya Jirga . The return of the refugees from Pakistan by the thousands bring back hope into the parched land. But B-52s still bomb and the more than two dozen countries eager to chart out Afghanistan's future remain confused themselves. A painful wait for peace may not come though. It is frightening: resilience also has a limit. Afghanistan can't afford pushing it further.